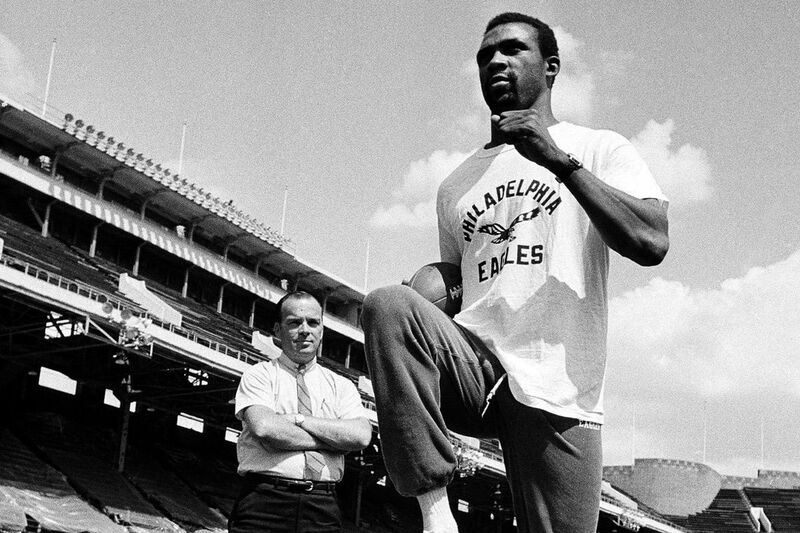 Former Eagles executive Jim Gallagher, seen here in 1970 watching Olympic track star John Carlos working out. Jim Gallagher, 88, one of just two Eagles executives in the team's Hall of Fame, died Saturday in Plymouth Meeting. Gallagher spent 46 years with the Eagles, joining the team in 1949 and retiring in 1995. He was named the team's personnel director in 1957 and also served as public relations director and director of sales and marketing. In 1990, he was named the Eagles' director of alumni relations, a role he held until his retirement. "Jim was one of the kindest and most remarkable men you could ever meet,'' Eagles owner Jeffrey Lurie said. "His dedication to this organization went far beyond the 46 years he spent here, and his impact was far-reaching. "Everyone who was fortunate enough to meet Jim knows how much he loved the Eagles, but also how much he truly cared for and invested in the lives of others. To borrow one of his famous phrases, Jim was a 'first-round pick.'" Gallagher worked with 17 head coaches and 12 owners, general managers, and team presidents. Born in Philadelphia, he was a graduate of Northeast Catholic High School. He later joined the Army and served in the Korean War. Gallagher is survived by his wife of 59 years, Betty' sons James Jr., Brendan, and Keith; daughters Lizanne, Meg, and Rosemary; and 16 grandchildren.